The versatile Leonardo AW169 comes with a wide range of cabins, and the red carpet indicates that this one is set up for VIP transport. The seats would look at home in a large-cabin jet, but the expansive windows afford a superior view. 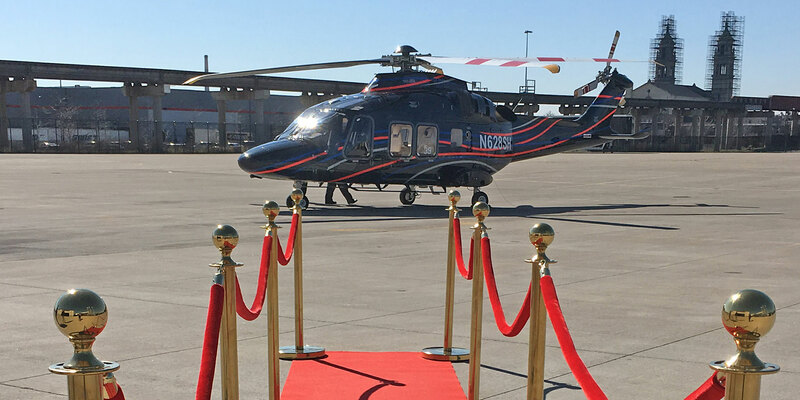 A red carpet seemed fitting as it led up to a VIP-configured Leonardo AW169 sitting on the ramp like a celebrity at Chicago’s Vertiport. The helicopter was making an appearance as part of a demo tour for prospective passengers and pilots. As a member of its Italian family, which includes the AW139 and AW189, the AW169 is Leonardo’s new light-intermediate twin. Designed as a multi-role helicopter, the AW169 can be configured for civil and commercial operations such as executive/private transport, aeromedical, search and rescue, security, energy, and utility services. With a 4.6-metric ton or optional 4.8-metric ton mtow and two 1,000-shp Pratt & Whitney Canada PW210A Fadec engines, the AW169 can be operated by a single pilot or a crew of two with up to 10 passengers. “We have more than 50 AW169s in operation right now in a multitude of segments. The helicopter is operating not just in VIP configuration but also in search-and-rescue, utility, and even wind energy as that continues to progress,” said Leonardo Helicopters manager of business development Michael Bucari. Deliveries of the AW169 began at the end of 2015, following EASA certification. The FAA greenlighted the helicopter in 2017 and the in-service fleet has logged more than 10,000 flight hours to date. “We have more than 160 AW169s on order. The aircraft is performing extremely well and the market has really accepted [it]. This reception has been through the roof,” said Bucari. Stepping into the cockpit of the AW169 is comparable to entering an operations control center. Three eight- by ten-inch large area displays support a fully digital glass cockpit while the view outside and above the panel permits expansive external visibility. Fully adjustable seats and a wide cockpit allow for a comfortable and unrestricted pilot operating environment. Crew workload is reduced by a four-axis digital automatic flight control system (DAFCS) coupled with a dual flight management system (FMS). “You’re really managing the cockpit. With the technology that this aircraft has, it will fly for you and you are the one managing everything else. This really helps to reduce pilot workload and allows the pilot to concentrate on their missions,” explained Bucari. The avionics suite of the AW169 has the ability to perform satellite-based IFR LPV approaches, and a helicopter terrain avoidance and warning system (HTAWS) and synthetic vision system (SVS) are standard equipment on the helicopter. The FMS also offers robust and customizable capabilities, including picture-in-picture overlays to aid in situational awareness. “It’s like a smartphone. Once you understand the architecture of the software itself, it’s very hard to go back to whatever you used previously,” said Bucari. In executive configuration, the cabin of the AW169 can seat four to eight passengers, and a wireless cabin control and entertainment system allow them to select and stream media on cabin monitors or personal devices. A unique luxury that lends itself to passenger comfort is the APU mode of the Pratt & Whitney PW210A turboshafts. The APU mode allows for continued operation of the environmental control system, radios, and medical equipment when the rotors are stopped. The AW169 features a variable-speed main rotor that reduces the external noise footprint while improving efficiency. It is the first helicopter in its category to support an electric retractable landing gear that helps to reduce maintenance requirements by way of a less complex system. According to Leonardo Helicopters, it is also the first light helicopter to feature a full-ice protection system, and Swiss Air Rescue Rega will be the initial operator to use this capability. Leonardo offers two HUMS monitoring centers for operators of the AW series. “We have one in Italy and one in Philadelphia. We typically work with operators on the offshore side, but it is starting to grow as more customers are signing up for HUMS data capture. It’s important to share that data so that we can start finding trends and baselines earlier for preventive maintenance,” Bucari told AIN. According to Bucari, the only outside vendor Leonardo relies on is for the helicopter’s main landing gear and the engines. “From a dynamic component standpoint, the fuselage, the avionics, the gearboxes, and the blades are all done internally by Leonardo. In fact, our gearbox is the first in this class that can be certified to run dry for 34 minutes,” he said. The VIP AW169 is currently on a seven-month demo tour and it is expected that a more utility-focused configuration will go on tour in the near future.